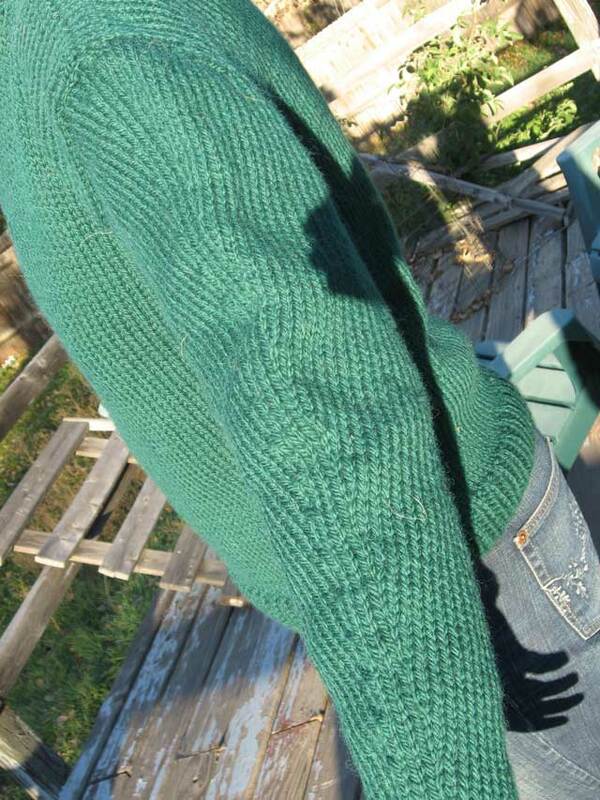 I’ve got a snapshot of what as far as I know is the first completed sweater worked by a reader from one of the templates in Ethnic Knitting Discovery by Donna Druchunas. Donna’s going to have a gallery of reader sweaters (at www.ethnicknitting.com, which at this writing simply links to a page on Donna’s main site). But since the gallery hasn’t reached critical mass yet, here’s a preview. I tried to catch the knitter in it, but she’s taking martial arts and escaped. So I asked my daughter to model, and she obliged yesterday afternoon as the sun sank low in the west. Kris worked the yarn a bit more firmly than the ball-band recommended 3.5 stitches/inch. She put it at just about 15.5 stitches and 18.5 rows to 4 inches (10 cm), which is close enough to 4 stitches/inch (16 stitches/10 cm) for me. The fabric has nice body and drape, as you can see. The sweater took about 7 balls, or less than 850 yards, of this yarn, at 123 yards per 100-gram ball. The sleeves are picked up from the body and worked down to the cuffs. Kris used a trick she learned from Meg Swansen at Knitting Camp and put her decreases along the outside of the sleeve, instead of along the underarm, as is usual. You can see that the technique shapes the garment well. 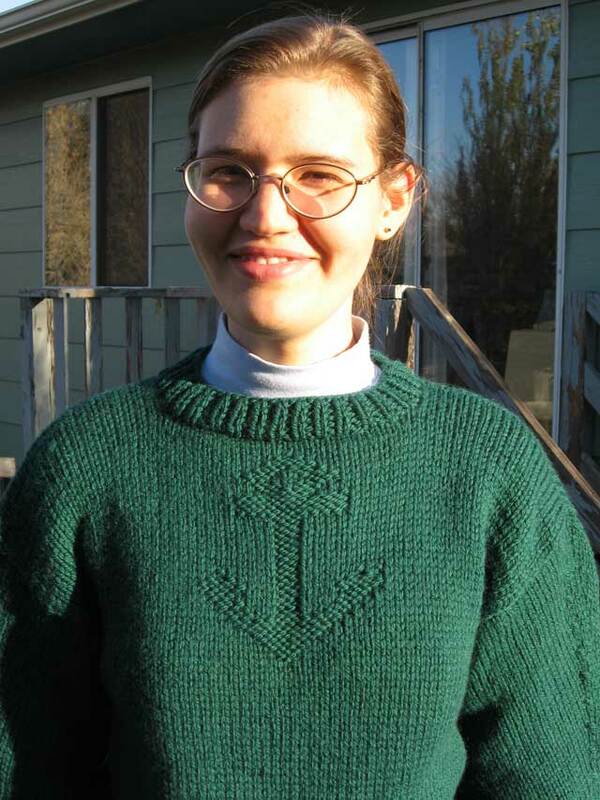 The visible decreases also look nice with the knit/purl anchor motif on this sweater. Kris, when told about this, said: "Tell her that it would be a great sweater, in that gauge, to start with, because it is SOOOOOOO easy! The gauge makes progress rapidly visible and rewarding." But it sure doesn’t look like a "beginner’s sweater"! Your daughter looks gorgeous in that sweater. Tell her to start knitting! Right away! (I’ll cheer from the side lines…) Good for you with the novel writing in November thing. I don’t really have the mental energy for that this year, but have always thought it sounded like fun. Bekah and I can have a sweater-brainstorming partay at Christmas! 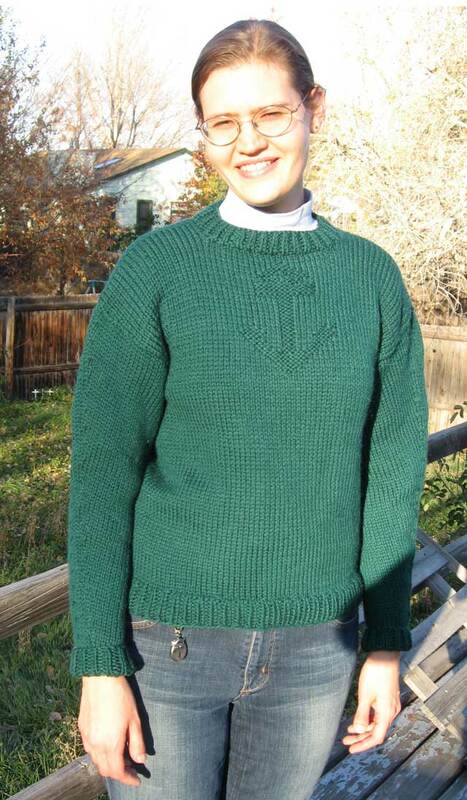 I doubt mine will look this shiny, though-this certainly doesn’t look like a beginner’s sweater.